Add the red pepper flakes, broth, water, juice from the tomatoes, and the Parmesan rind; bring to a boil and then lower to a simmer for 10 minutes. Remove the rind; add chopped tomatoes; simmer for 10 minutes. Add salt and pepper if needed. Add the fresh spinach, stir until wilted, and remove from the heat. I'll have this soup for a few lunches this week. 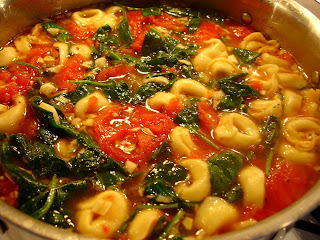 As the week goes on, the tortellini does start to soak up the broth. If this happens, you could definitely add a bit of broth and let it simmer on the stove for 10 minutes or so. Enjoy!